The 51st Annual Descendants of Ransom Jones Reunion will be held at Sequoyah State Park, on Saturday, August 6, 2016. We are back at the Group Camp facility as in the past few years. We can occupy the premises much earlier this year, since it is not booked by another group the previous night. I will probably open the facility at 10 a.m., and could use some help setting up the table and chair layout. The Group Camp Community Building has adequate air conditioning. As you may recall, the kitchen is furnished with an ice maker, upright freezer and a walk-in cooler. If you use camp kitchen items, such as pots and pans, make sure you clean them yourself. Thanks. The total charge for the group for the weekend is $200, which I always pay several months in advance. We collect $4 for each person who is five years of age and older. If the math doesn?t work for the number of attendees, we could raise the fee to $5 on the day of the event. We will try to serve dinner sometime between noon and one o?clock p.m. We will have access to the building until late evening. Please do your part in the cleanup process before departing. The Group Camp Community Building is very near the office, out closer to the highway. Take the first right after you enter the park property. 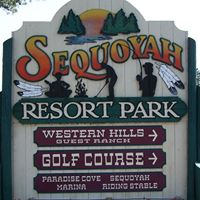 Sequoyah State Park is 8 miles east of Wagoner, Oklahoma, just off Highway 51. Watch for the main park sign out by the highway. As soon as you turn into the park entrance, make a hard right onto the first road before you get to the office. This sign will say, ?Group Camp?. 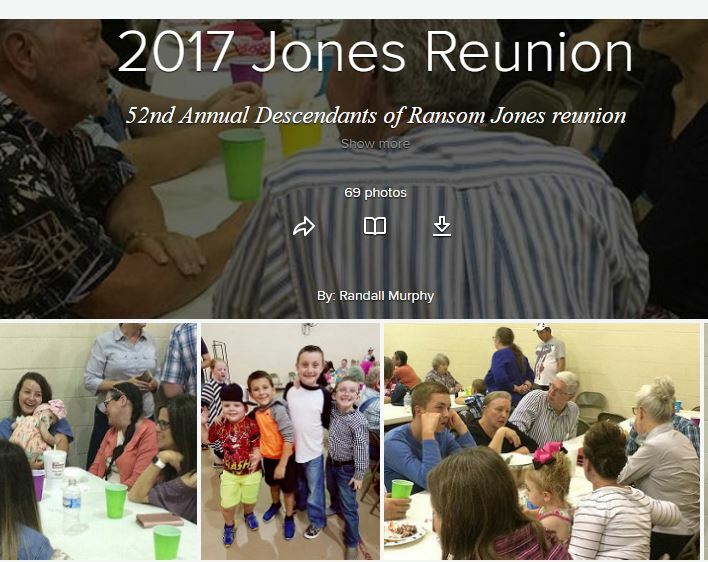 This is a reminder about the 50th Annual Descendants of Ransom Jones Reunion at Sequoyah State Park, on Saturday, August 1. We are back at the Group Camp facility, which seemed to work out well last year. The main Community Building that we use does have adequate air conditioning. As you may recall, the kitchen is furnished with an ice maker, upright freezer and a walk-in cooler? much like Lutherhoma. I suggest that we use as few as possible of the dishes and pots/pans owned by the facility, in order to facilitate an easier cleanup. If you use camp kitchen items, make sure you clean them yourself. Thanks. The total charge for the group for the weekend is $200 plus a refundable $200 cleaning deposit, both of which I always pay several months in advance. We collect $4 for each person who is five years of age and older. If the math doesn?t work for the number of attendees, we could raise the fee to $5 on the day of the event. One important detail is that, like last year, we will not have access to the facility until noon or so, since another group will be vacating the building and property at that time. We will try to serve dinner as soon as possible after we are cleared to enter the facility, so there won?t be a lot of prep time. We will have access to the building until late evening. Please do your part in the cleanup process before departing, so that we can get our deposit back. The Group Camp Community Building is very near the office, out closer to the highway. Take the first right after you enter the park property.